Supposed to be quite thick per accompanying photo, and it is. Not sure how this is "bouillon" or what it could be used for. Quite good using my own bean mix following recipe guidelines. Hearty and tasty. Used Soup program with no time adjustment. Came out perfect. 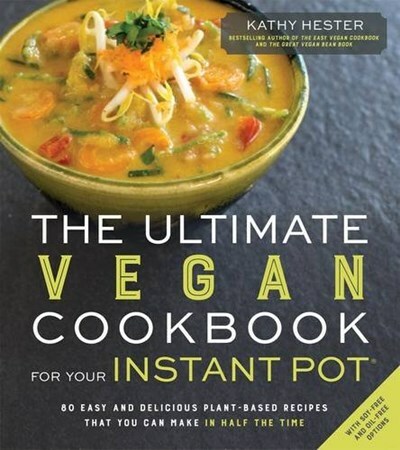 As the Instant Pot becomes increasingly affordable and popular among home cooks, who better than to teach vegans the ins and outs of this handy appliance than bestselling vegan cookbook author Kathy Hester? In The Ultimate Vegan Instant Pot Cookbook, Kathy presents 80 new and unique recipes using the many features of the 7-appliances-in-1 Instant Pot, which includes a pressure cooker, slow cooker, yogurt maker and steamer. The Instant Pot does most of the work for less kitchen stress and mess, and it produces astoundingly delicious results. Recipes include Autumn Mushroom Bean Soup, Quinoa Chickpea Scramble, California Vegetables in Cheezy Sauce, All American Tempeh Chili, Mushroom Stroganoff Over Instant Pot Potatoes and even desserts like Vegan Cheesecake and Smores Sweet Potatoes. Readers also save money by easily making their own staples such as vegetable stock, nondairy milk, yogurt, seitan and cheesy sauce. With plenty of introductory material, readers can learn about using the different features of their Instant Pot, nutritional benefits of each, do’s and don’ts and how to care for it. This cookbook helps vegan home cooks confidently use the Instant Pot to prepare their own nourishing staples and delicious meals for their families.